Jamming devices are radio frequency transmitters that intentionally block, jam, or interfere with lawful communications, such as cell phone calls, text messages, GPS systems, and Wi-Fi networks. Jammers are illegal to market, sell, or use in the United States. A single violation of the jamming prohibition can result in tens of thousands of dollars in monetary penalties, seizure of the illegal device, and imprisonment. May 2016: FCC imposed a fine of $34,912,500 to a Chinese electronics manufacturer and online retailer for marketing 285 models of signal jamming devices to U.S. customers for more than two years. August 2013: FCC proposed a fine of nearly $32,000 for an individual whose illegal use of a GPS jamming device on the highway outside Newark Airport interfered with an aviation safety system in 2012. April 2013: FCC fined two companies for using illegal signal jammers at their worksites. The fines were set at $144,000 and $125,000, respectively. October 2012: FCC announced enforcement actions against individuals selling signal jamming devices on craigslist.org, warning that the Bureau intends to impose substantial monetary penalties for similar violations going forward. 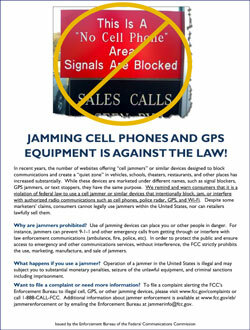 October 2011: FCC announced it had issued 20 enforcement actions against online retailers in 12 states for illegally marketing more than 200 uniquely-described models of jamming devices. "We need consumers to be our eyes and ears. Jammers do not just weed out noisy or annoying conversations and disable unwanted GPS tracking, they can prevent 9‑1‑1 and other emergency phone calls from getting through in a time of need." Learn about applicable laws, recent enforcement actions, and more.